A team of six civil engineering students from the University of Ottawa (uOttawa) will invest much of their 2018/19 academic year advancing MOOSE Consortium’s plan to adapt the Prince of Wales Bridge between Ottawa and Gatineau, the consortium says in a news release. Moose says the student project design will accommodate combined operations of full-sized bi-level regional trains and smaller LRT trains, respecting federal regulatory and safety management conditions. It will include cantilevered cycling and pedestrian trails, a pedestrian bridge over the tracks on the Lemieux Island and Parliament Hill views. 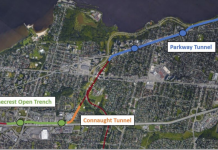 Both teams will be supervised by senior civil engineer Wojciech Remisz, president of the REMISZ Consulting Engineers of Ottawa, who in 2016 prepared preliminary multi-use plans for rehabilitation of the Prince of Wales bridge for the MOOSE Consortium. In other work, his company provides quality verification services for Ottawa’s OLRT project. For the start-up station system design project, the student team will use preliminary reports and concepts prepared within MOOSE Consortium by senior conservation architect and urbanist Mark Thompson Brandt, president of MTBA Associates Architects. In a news release, MOOSE says Alan R. Perks, engineer- in residence for uOttawa’s Department of Civil Engineering invited Remisz to suggest some useful projects and to serve as a mentor for this year’s fourthyear student “capstone projects”. Remisz put forward the two projects on a list that students could choose from and received a very positive response. “Apparently this was the top most interesting project on the list. They had to bid to get it. The students loved the idea and swamped me with questions about MOOSE. It was a fantastic, highly stimulating meeting,” he said. 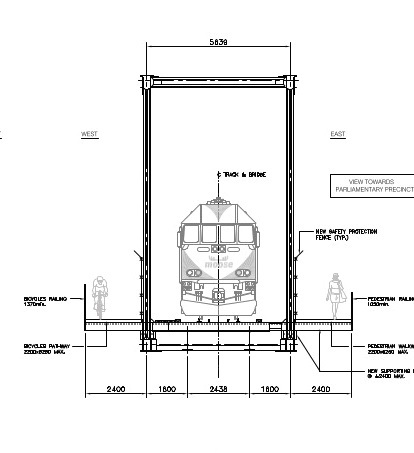 “At our initial team meeting on the stations, one suggested to have a split level building, with a mezzanine accessible by stairs and a lift so people have a pleasant place to wait, including wi-fi, seating and tables. Another suggested to have commercial units, including a café, much like MOOSE’s proposal for market stalls, and other commuter conveniences that suit individual locations,” he said. The civil engineering “Capstone Project” is for academic credits towards graduation. It provides students the opportunity to learn from professional mentors throughout the full academic year to April 2019.